The previous part of this investigation of the TARDIS Console dealt with the prop built for Jon Pertwee but now it gets really interesting (if you're interested in this sort of thing). 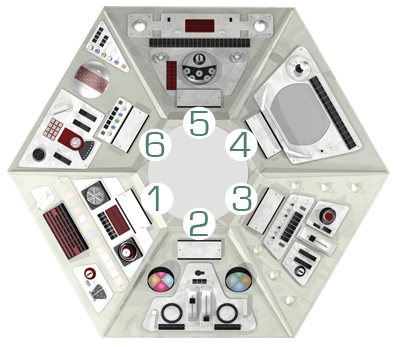 The second console built during the 70s had deliberately echoed the layout of the first from the 60s, but once Jon Pertwee departed, the interior of the ship wasn't seen for some time. After Tom Baker took over as the Doctor, the TARDIS was virtually removed for his first season and no scenes were set inside it at all. Terror of the Zygons was carried over for broadcast the following year, but the first real story in production of Season 13 was Pyramids of Mars which required the inside the ship for the first time in five months. 20th May 1975 saw the first ever taping of a Fourth Doctor scene inside the TARDIS and a brand new console was constructred for the occasion. Whereas the surface of the previous console prop had been noticably yellowy-green, the Version 3.0 console was more white - or at least "off-white". The use of colour across the whole prop was more subdued and most panels featured mainly red and black controls. The inspiration for mounting many of the components on a metal backing has its origins in a repair done some four years previously. 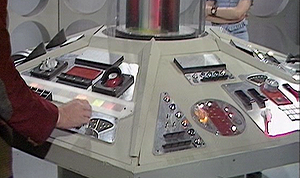 When a whole new panel was replaced on the Version 1.0 prop for its appearance alongside Jon Pertwee, a large silver cover was used and new switches and dials were mounted onto it. When the Version 2.0 prop was made as a copy of its predecessor, this repaired panel was copied too. And so when the Version 3.0 console was constructed, metal plates were used on many of the panels. The Version 3.0 Console recycled the same central column but the green perspex tubing became red to match the less gharish colour scheme and create a more timeless and futuristic look. The panels are numbered here (left) for reference as they would continue to change throughout the Tom Baker era. Panel 1 was initially used by the Doctor for flying the TARDIS. Other notable points of reference on the new panels included two large Glare Shields on Panel 2, whilst Panel 3 retained three columns of Bubble Light Covers as per the original prop. Panel 4 was given a large monitor screen (never seen to function) and Panel 5 contained a set of five distinctive "eyeballs" surrounded by a perspex cover. Panel 6 featured a clear plastic dome with a circuit board beneath beside which had one of many L-shaped levers from the original console - this one opens the main doors. Two months after its initial use, the console was needed again for taping of Planet of Evil on 14th July 1975. Perhaps the most surprising thing to learn about the Console 3.0 is that the configuration of its panels was not fixed. No sooner had it been assembled as described above, than it was reassmebled for its second outing with the panels ordered 2, 1, 6, 3, 4, 5. Due to quick reconstruction, one of the triangular spokes between the panels is badly out of position (as shown left). Having gone to all this effort of designing and building a new prop, these two stories (broadcast in the reverse order to which they were recorded) were the only two occasions on which the new console was used before producer Philip Hinchliffe decided on an entirely different approach. 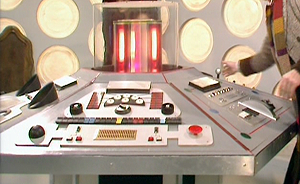 At the start of Season 14 an alternative secondary console was introduced to accompany the Jules Verne wooden style control room and this served in four out of the six stories of that season. When Graham Williams took over, the normal white control room returned completely redesigned for The Invisible Enemy in Season 15. The accompanying console prop had undergone considerable refurbishment after two years in storage and it went before the cameras on 24th April 1977 looking very different. Panel 1) The black housing is missing from the red mushroom button. The strip of multicoloured lights and the coarse grill have been transposed, so that the lights are now at the lower edge of the console. This has the curious result of creating a face on the console (pictured right). Panel 6) The big perspex dome has been replaced by a raised circular screen within a black cylindrical housing that has fitting prongs protruding, looking somewhat like a black drum. The rim of the small pressure gauge has been picked out in yellow. Panel 2) No changes made but Leela uses the main lever to close the doors. Panel 5) The metal plate holding all the surface controls has been painted white. An extra sixth eyeball has been added and the perspex surrounding them has gone. Circuit-lines have been drawn to connect the "eyeballs" to the red keypads either side. The silver analogue controls and the silver dome in the bottom left have been painted black. The lengthy row of switches has had two picked out in red, two in blue, one in yellow and one in sky blue. The red grille at the bottom has been painted yellow (pictured right). Panel 3) The six bubble light covers have all gone and been replaced by discs stuck on the surface of the console, with green at the top and bottom of the column and blue in the middle. Linking each of the discs is yet more red piping (pictured above right). Panel 4) The monitor screen panel had its covering frame removed from the top edge and the base for the joystick-toggle changed from silver to black. The new red trim, the painting over of reflective sections, combined with the addition of blue, green and yellow detail made the revamped console less mechanical-looking and more bright. The prop was in identical condition when it returned to studio three months later to record scenes for The Sun Makers on 4th July. 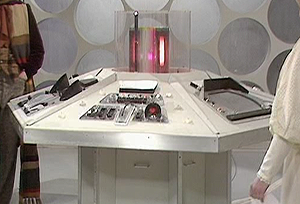 The fourth panel configuration came in Underworld, after the prop was assembled for recording in October 1977. This time Panel 1 (now with a face) and Panel 2 had been swapped over with the other four panels staying the same as last time. 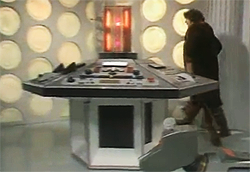 On November 6th, the console was used in The Invasion of Time for which the only change was on perimeter of the prop where it had been painted darker and then sanded down again. When studio work resumed on Doctor Who five months later for the new Key to Time season, some refurbishments had been carried out ready for 25th April 1978. The outer rim of the console had been painted black, new strips of red piping had been added around the lower edge of the column's collar and the red on the top rim had been removed. The other specific change was that a small socket was created for the locator to plug in, and this was added next to the right "eye" of the "face" on Panel 1. The configuration of the panels had changed again but this time it was not a completely new combination, but a reversion back to its last-but-one appearance for The Invisible Enemy. Two months later the TARDIS was wheeled out again for the second installment of the Key to Time: The Pirate Planet for which no specific refurbishments were carried out, however there was quite noticable change. The left-hand Glare Shield had been lost from its panel, never to be replaced (pictured right). A further two months on saw the console in use for The Androids of Tara for which some curious changes had been made. The thick red lining between the panels had been removed and a black buffer separated the panels. Two large yellow labels had been stuck on the console bearing the letter "P", and these were positioned in either corner of Panel 5 (pictured left). On the adjacent panel the green and blue discs were filled in to become circles. On Panel 6 another yellow and black letter was stuck in the bottom right hand corner - this time a back-to-front "E". More new decoration was in evidence beneath the sole surviving Glare Sheild. The inverted-T shaped plate on which all the components were mounted had been surrounded by a pale blue border. Either side of it, filling up the empty space up to the edge of the panel, were four vertical strips of the same blue tape (pictured above right). Panel 4 was also edged with the same electric blue piping, and the frame of the monitor screen was decorated with vertical red stripes and differently-shaped discs. The console was not needed for production of The Power of Kroll, but it was refurbished again for the season finale, The Armageddon Factor and went before the cameras on the 5th December 1978. The following Season 17 went into production with what would be the third story broadcast: The Creature From The Pit. In the studio session on 24th April 1979 the newly-created Randomizer was missing from the console and curiously the lever which had become red at the end of The Armageddon Factor was back to its original black again. 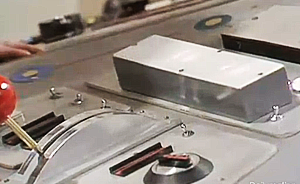 To the right of this lever, the controls had been replaced with a circular perspex tray with five pins, onto which Romana slots the TARDIS's disconnected Mk 3 Emergency Transceiver (pictured right). In addition to the deliberate changes, a large hole had appeared in the bottom left corner of Panel 4. 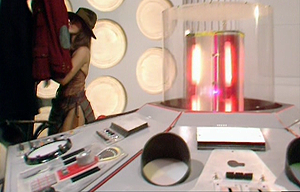 No TARDIS scenes were recorded for City of Death, so the next time the console was in use was on 15th July 1979 for Romana's controversial regeneration shot at the beginning of Destiny of the Daleks. The Randomizer was back in place and, bizarrely, so too was the red lever once again, and it would stay hereafter. The perspex connector tray was still in situ, but the Mk 3 Emergency Transceiver had been removed (and rightly so, as this story would be broadcast first). Again, a story was skipped before the TARDIS was needed again on October 9th 1979 for the Horns of Nimon. For the scenes at the beginning of episode one, the clear plastic tube which formed the exterior of the central colum was removed to expose the inner section (pictured left). The Randomizer was once again absent and the surface of the console was covered with wires, books and equipment as part of the Doctor's repairs, but the prop was otherwise unchanged. The next story would have been Graham Williams' last, and the season finale but, due to industrial action, Shada was never completed and its scripted scenes inside the TARDIS were never shot. Incoming producer John Nathan-Turner overhauled various aspects of the show when he took over for Tom Baker's final season including the exterior Police Box shell, but the interior of the TARDIS was one thing which was given virtually no attention. It wasn't used at all in The Leisure Hive, although reference was made to the Doctor having bypassed the Randomizer in order to deliberately visit Brighton. The Randomizer however hadn't appeared on the console since the story in which it was first seen. The console was made ready for the studio session on the next story; State of Decay which took place on 15th May 1980. It was given a new coat of paint around the rim, returning it to silver and a number of modifications were performed to one panel as a consequence of the requirements of the script. Because the Doctor was required to get a hard copy of information from the TARDIS memory banks, a dot-matrix printer was fitted into the centre of Panel 1. This had the knock-on effect of disrupting the "face". The "eyes" were transposed so that the red mushroom button was moved to the left and the silver star dial was put on the right. The plate on which they had been sitting was removed, as was the grille that had acted as a "nose", and in their place in the middle the printer was mounted, with a brown cover. When the console appeared for use in Meglos at the end of June 1980 it had one difference by accident rather than design. The semi-circular plate and its collection of eyeballs had been lost. Two months later when it was prepared for Full Curcle the eyeballs had returned again and one other notable change was made: A large, red hemisphere had been set in the centre of that panel, with two blue bubbles either side (pictured left). The console was used again the following month when September 26th saw recording of Warriors Gate, for which small alterations had been made again. The silver star dial which had been the right "eye" of the face had been replaced by a trasparent green protruberance with a tube in the centre (pictured right). One speaker grille was modified to encase a number of lights under a glass panel. During recording, the large red hemisphere which appeared in the previous serial was lost and doesn't appear again. A rare modification was made to the central column, as three hemispherical caps were introduced to each lighting element, with them wired into the centre (pictured left). November 5th 1980 saw the next TARDIS recording for the serial The Keeper of Traken. For the first time in nearly two years the console was reconstructed in a different configuration. Since its previous appearance two months ago, Panel 4 had been swapped with Panel 1, and Panel 6 has swapped with the Panel 2, with the other pair unchanged. However, in the following story Logopolis, the final pair also swapped with each other for Tom Baker's final story recorded on January 8th 1981. A few other changes were made, such as the top discs being replaced on Panel 3 where they had fallen off earlier in the season, but more significantly the set of switches above the Red Knob were replaced as part of the integration of a new unit. 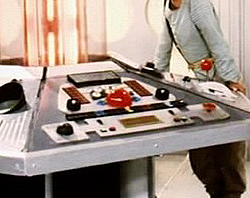 A computer keyboard that controlled the Chameleon Circuit was rigged to emerge from this panel in the console, pushed up on a set of rods. The mechanism didn't fit easily into the body of the console and so the base had to be modified to accomodate it, with a diagonal block added underneath (pictured right). An unintentional change happened during recording Logopolis when one of the silver hemisphertical caps dropped off the top of the central column (pictured left). The Third Console prop would continue to be used in the following season after Peter Davison took over as the Time Lord, but as we shall see in the next part of the History of the TARDIS Console, all had changed again.